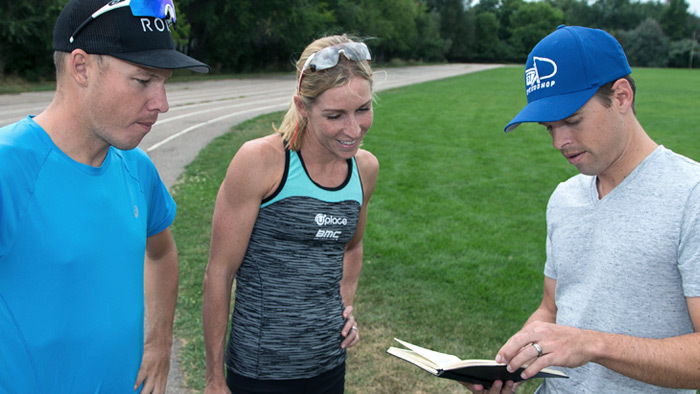 This series highlights two athletes, Liz Blatchford and Callum Millward, and their coach Mat Steinmetz as they work towards their goals as professional IRONMAN athletes. This first installment illustrates the long term planning that is the backbone of their process. Liz Blatchford and I started working together at the end of the 2012 season. Liz had just finished her ITU career and was looking to make the jump to long course racing. She’d already competed in a few half IRONMAN events, but had her sights set on racing the IRONMAN World Championships in Kona, Hawaii. In 2013, the plan was to race 70.3 events throughout the season. Then, to jumpstart the Kona qualifying process, enter a late season IRONMAN. However, things changed as we began the season. Liz decided that Kona was the only race that inspired her and rather than waiting, would pursue this goal. With her background as an ITU athlete and limited experience racing long course, I put a heavy emphasis on bike endurance and run durability. I had to carefully map out a schedule that would allow Liz to qualify for Kona without damaging herself. This schedule would go against my typical style. I like preparation and for athletes to go into races rested and ready. To pull this off, I knew that Liz would have to race multiple IRONMAN events in close proximity to one another. This plan would only work if Liz agreed to properly recover from each race, to not panic or jump back into training too quickly. This block began with Liz racing her first ever IRONMAN in Cairns, Australia on June 12th. She won this race and gained a lot of knowledge. Gaining experience was one of the positives of this racing block. As much as we try, it’s hard to simulate racing an IRONMAN in training. After recovering from Cairns, she entered IRONMAN Mont Tremblant on August 16th, where she finished 4th and earned enough points to qualify to race Kona. Eight weeks after Mont Tremblant, Liz finished 3rd in Kona securing her result with a strong back half of the marathon. It was an excellent result and our plan worked. Even though the 2013 plan was successful, I didn’t see it as a sustainable way to prepare for Kona each year. Because of this, we decided to take a different approach in 2014. Liz still needed to race an IRONMAN to secure her start in Kona. She went back to Cairns where she defended her title for the second year in a row. But, rather than racing another IRONMAN as she did in 2013, we went into a training block focused on speed across the 70.3 distance. This plan seemed to be going great and Liz was hitting great numbers in training. However, when it came time to race in Kona, Liz just didn’t feel like she had it. She felt flat and finished a disappointing 10th. There could have been a number of reasons why a race doesn’t go according to plan, but the major difference between 2013 and 2014 was not racing another IRONMAN between Cairns and Kona. I began to wonder, did all the IRONMAN racing in 2013 make her strong for Kona? This year, we decided to go back to a similar format that we used with great success in 2013. We’d use IRONMAN racing to prepare Liz for Kona. Having documented all the training since we had worked together, we had a blueprint to use as a guide when mapping out the 2015 plan. The core of Liz’s program consists of steady state training volume done between 70 to 80 percent of threshold. The goal is to build superior endurance with workouts designed to test Liz’s ability to be strong on the back half of sessions. The remainder of the training is either easy or high intensity. This keeps the program balanced. The program works because Liz understands the process and has the patience to see it through. IRONMAN breaks you down and if you don’t let your body heal from the event, you’ll struggle to use each block to layer or build your fitness. Instead, rather than getting stronger, you just get more tired. Fastforwarding to 2015, Liz is off to a great start. 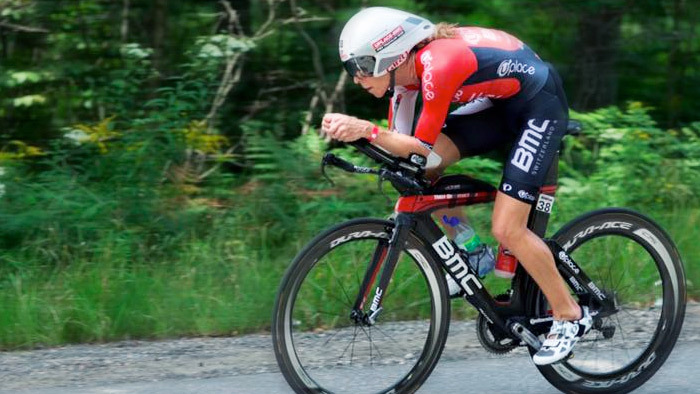 She won IRONMAN Cairns for the third year in a row and placed 2nd at IRONMAN Mont Tremblant. At Mont Tremblant, Liz was just 50 seconds from the win. You want to win anytime you race, but what was so positive at Mont Tremblant was how strong she finished. She was also 13 minutes faster than when she raced in 2013. At the moment, Liz has begun getting back into regular training after recovering from Mont Tremblant. The question remains, will this strategy work as it did in 2013? IRONMAN is the type of event where you’re limited in the number of races you can compete in. It doesn’t leave a lot of time for a coach and athlete to try multiple approaches. It’s important for Liz to focus on executing her own race. She can’t control what anyone else is doing out there. If she feels strong and is able to produce a good performance, I view that as success. Callum and I started working together towards the end of the 2013 season. The main objective was to provide more structure within his training. Callum was already a very consistent racer across the 70.3 distance, but wanted that extra few percent to contest for the win. I also knew that after the 2014 season, he’d be making the jump to IRONMAN racing and would rely on my experience to successfully do so. Callum and I started planning his race schedule well in advance of the 2015 season with the goal of qualifying for the IRONMAN World Championships. We started with the end in mind and worked backwards from there. Poor planning or over-racing is not forced on an athlete. The Kona Points Ranking system (KPR), which is often the scapegoat, does not force professional athletes to chase points if they’ve planned properly. I’m not saying it’s the perfect system as circumstance such as injury, mechanicals, or poor performances can lead to situations that are not optimal. As a professional athlete, qualifying for Kona starts with optimizing the race schedule. This is where most athletes make their first mistake. 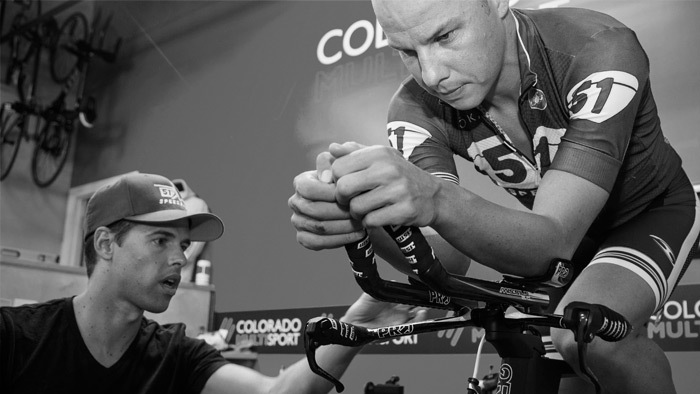 I understand that professional triathletes have to maximize their earning potential. However, if qualifying and racing well in Kona is key to your brand/business/career and you’re starting the year with zero points (like Callum), you have to center the entire year around this process. You can’t lay out your typical racing calendar and expect to squeeze in a couple Ironman races. In order to get points, we had to go after high point value races. The KPR system is set up so that high profile races have more points available than others. The IRONMAN Championship races have 4000 points (P4000), all others have 2000 (P2000). For instance, placing 5th in a P4000 race distributes more points than winning any other Ironman. This system is the same for 70.3 events, only with lower overall points available. Putting a 4000 point race on Callum’s schedule was a no brainer. Callum jump started the year at the 70.3 Asia-Pacific Championships in Auckland, New Zealand which is the equivalent of a P4000 race, but for the 70.3 distance (P1500). Next up was IRONMAN Melbourne (P4000) where he placed 6th in a time of 8:14. As he does every year, he then came to Boulder, Colorado for the summer. He raced two more times in June, winning Boulder 70.3 and placing 2nd at IRONMAN Coeur d’Alene. Callum raced only four times and was able to accumulate enough points to qualify for Kona. This new style of fewer races has been a positive change for Millward. “I found in 2014, there’s a point of demising return on fitness and results when racing consecutive 70.3 races across only a few weeks,” said Millward. “I had an injury heading into the 70.3 World Championships, and the race didn’t go according to plan. The decision was made to tack on an extra race at the end of the season, which would mean three 70.3 races in just 6 weeks. The reality is, my results were below par. In hindsight, by tapering for multiple races, fitness and strength is eventually compromised, and I got found out. After learning lessons the hard way in 2014, the pair took a different approach to this year. “In 2015, we took the approach of less is more, and my results have been a lot better. This was partially a result of the respect for Iron distance racing, and the toll an 8 hour race has on your body,” commented Millward. Most athletes would perform better if they got a handle on their racing schedules. Training is how you get fit. Planning a season so that you can train, taper, race, and repeat will allow an athlete to build upon their fitness throughout the year. This layering effect allows you to perform each time you toe the line. But I see many athletes binge racing to the point where they are either losing fitness because they can’t train between races or they’re skipping recovery and making themselves tired. The end result to either option is under performing. A lot of athletes make this mistake because it’s difficult to see the negative consequences as this approach can have short term success. But you won’t see athletes that are consistent year after year using this approach. Since the top ten finishers in Kona carry over their points to the next season, if Callum can crack the Top 10 at Ironman Hawaii then he will have more freedom in his planning for 2016 as he will only need to race one IRONMAN. I will still have him plan out his race calendar, but racing 70.3 distance requires less recovery time and allows you to race more. Typically, if you race an IRONMAN, you’ll need at least four weeks until you can properly get back into training… and then another few weeks after that before you’re back to pre race training levels. The key is to take advantage of the year round triathlon calendar. This allows an athlete to prepare and recover from each race without feeling pressured to compromise because of a poor scheduling decision. In part two of this series, we will look at a few race specific sessions both Callum and Liz do to prepare for the demands of race day. I will also touch on struggles that occur and when adjustments need to be made to the program.